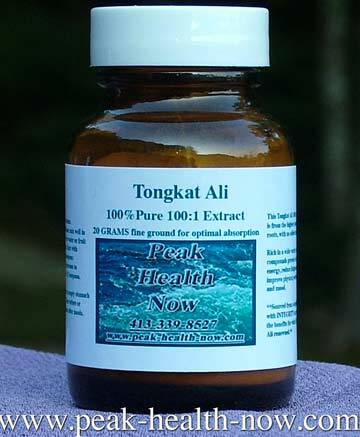 Tongkat Ali dosage: When you find the real deal in TA, you are dealing with a high-octane compound! Keep this in mind when creating your protocol. In a nutshell, TA is a supplement suited to healthy, emotionally and physically sound individuals who simply want to get more out of life and maintain vitality as they grow older. CONTRAINDICATIONS: If you are fatigued, chronically ill, weak, sick and toxic - this herbal extract is NOT for you - at least not now! Because it puts a bit of back-pressure on the system, increases excitement (it IS, after all, a mild stimulant), Tongkat Ali dosage will raise your metabolic rate. If you are suffering from fatigue, you would be pushing your body to do something it is not yet ready to do. To facilitate deep healing, you want to be more in Parasympathetic mode (the nervous system's 'rest-and-digest' setting). Forcing high output of energy will only leave you more fatigued. Save the Tongkat Ali dosage for when you are feeling more vital. First, pursue a long-term detox and rebuilding protocol (plenty of info and products for that throughout this site). Once you are feeling vital, balanced and healthy, Tongkat Ali dosage might be appropriate. As with many supplements, if you are pregnant or nursing, do not use this. For those with insomnia, TA is also not recommended. If you tend to have high blood pressure, do not take - you don't need more back-pressure on your system. Also if you anger easily, suffer mood swings, anxiety, insomnia, or are on medications such as Prozac, you might want to skip this one. If you are taking ANY prescription medication, do not take any Tongkat Ali dosage until you consult with your pharmacist. Since Tongkat Ali dosage increases excitement, it is a good choice for healthy people who want to enhance their zest for life, ambition and passion. It is popular with weightlifters - a good workout supplement. As we grow older, such an energy boost is welcome, especially for those who want to be actively engaged and fully alive. TA can serve that purpose admirably. Be VERY conservative with Tongkat Ali dosage when starting out. DON'T do what we did! 1/8 teaspoon or less is a nice amount at the beginning. FREQUENCY OF USE: I would suggest only once per week, twice maximum - tolerance builds up REALLY easily with some botanical extracts and Tongkat Ali dosage should take that into account. Once tolerance builds up, the product ends up becoming ineffective. My husband and I use it two consecutive days, then none the rest of the week. Just mix well in 6 - 8 oz tepid water and chug it down. **Take on empty stomach at least 4 hours after a meal! ** Wait an hour before eating. Before your meal you may want to drink some water or juice. Ideally, do your Tongkat Ali dosage by noon - taken late in the day, it could make it more difficult to fall asleep. Tongkat Ali Dosage: BUY the BEST!